Through scale, form, smell and touch, Ernesto Neto’s work invites us to experience a heightened awareness of our own sensing and feeling bodies. His sculptural forms and installations are over-whelmingly sensual and yet they have a formal harmony and simplicity that derives from their conceptual clarity. They might be thought of as exemplary manifestations of Brazil’s dialogue between the modern megalopolis and the primordial jungle, where the constructed and the organic remain in permanent tension. 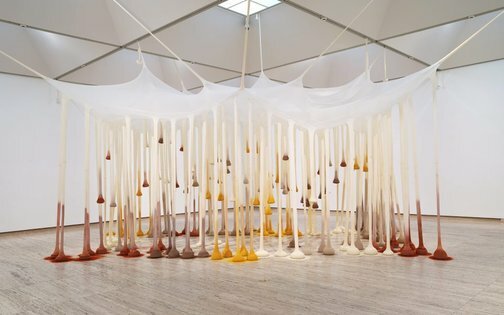 Ernesto Neto lives in Rio de Janeiro and is one of a new generation of Brazilian artists who emerged in the 1990s. There are many fascinating contradictions and traditions in Brazil that find representation in the diversity of its contemporary practice. In the recent past there has been a strong ‘concrete’ art movement that resulted in aggressively modernist architecture and design, as well as sculptural form and painting. In contrast, there is an older tradition that derives from the meeting of vivid Portuguese Catholic iconography, African rituals, objects and shrines, and surviving indigenous cultures found in the jungles and mountains. It is against this background that the younger Brazilian artists are making their way. They have a strong sense of modernist aesthetics yet there is a passionate attachment to materiality and sensuality in their work that is expressed in a performative, even ritualistic, approach to materials and spaces. The senses are engaged in a multiplicity of ways and the body is discovered in unexpected encounters with the church, the butcher’s shop, the bordello, the carnival and the life of the street. In this environment objects and materials taken from everyday life can be made to resonate with complex cultural and personal associations. The body and its senses are integral to Neto’s work; his installations stretch the membrane that separates art and life. Neto’s use of transparent elastic fabric describes the tension of spaces he invades while anthropomorphising architecture. Vast masses of fragrant spice swell the fabric in voluptuous, almost bodily, forms that fill the gallery space and our olfactory organs with its aromatic intensity. Unlike vision, smell entails the physical invasion of the body by the scent’s particles. In this way the sensations evoked by Neto’s spice works are involuntary and almost instinctive. ‘Just like drops in time, nothing’ has multiple associations, including rain capturing a ray of light or glancing through a forest, but it always refers back to the presence of the body, indicated by the bulging forms and even by the close association of lycra with underwear or stockings. At the same time there is a sublime architectural allusion created by the curving translucent arches that articulate the whole room. Anthony Bond, Contemporary: Art Gallery of New South Wales Contemporary Collection , 'Objects and associations', pg.332-381, Sydney, 2006, 358, 359 (colour illus.). Lisa Catt, Look , 'Art and evolution', Sydney, Sep 2018-Oct 2018, 42-44 (colour illus.). Space to dream: recent art from South America , Auckland, 2016, 72-73 (colour illus. ), 192, 193 (colour illus.). Art Gallery of New South Wales annual report 2003 [for the year ended 30 June 2003] , 'Year in review', pg.14-35, Sydney, 2003, 18.